Hedge funds have been known to move stock prices, sometimes dramatically raising volatility of specific shares. Here are two latest trends on hedge funds' equity holdings that may have some impact on equity volatility going forward. 1. Investment allocation in small-, mid-, and large-cap stocks for an average fund is about a third for each of these categories. So one would think that by taking the full hedge fund universe, it would be equally weighted across the three capitalization groups. But that is far from reality. 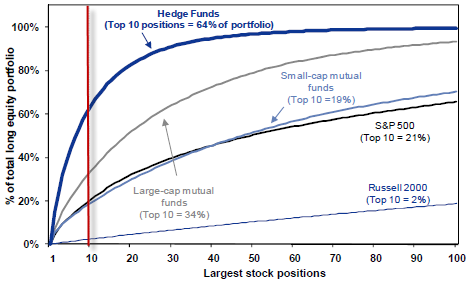 Small hedge funds like small-cap stocks and large ones prefer large-cap stocks. It means that as the large funds become even bigger, the overall percentage of large cap stocks within the hedge fund universe should rise (simply because large hedge funds control a bigger portion of the total hedge fund assets). 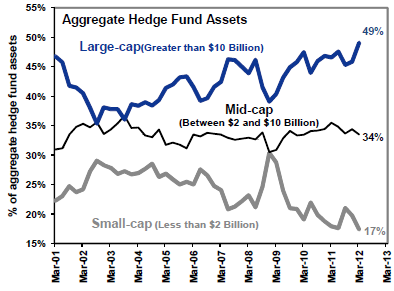 That has indeed been the case, with small caps representing only 17% of the overall hedge fund equity AUM. 2. Hedge funds run highly concentrated portfolios. The latest numbers from Goldman indicate that top 10 positions make up some 64% of hedge fund equity portfolios. That compares to 34% for large-cap mutual funds. Such concentrations indicate that hedge fund overall performance is driven by just a few stocks. Combining 1 and 2 above tells us that certain large-cap stocks could experience dramatic moves, as hedge funds change positions in these names. Large concentrations and significant holdings could result in some outsize volatility.